Grab some sunblock and the latest best-selling paperback - there's a lounger with your name on it. Whether you spent the day skiing, hiking, or shopping - you totally deserve it. Give your crew a hearty breakfast before hitting the slopes. Catch a ride on the 8-Passenger BreckConnect Gondola, a 7 minute walk from the resort. Go for a swim in the heated outdoor pool – open year-round. A soak in the outdoor or indoor hot tub is the perfect way to relax after the day on slopes! Lace up your shoes, Spruce Creek Trail is a 13 minute drive from the resort. Work on perfecting your swing at Breckenridge Golf Club, just an 8 minute drive from the resort. This charming mountain lodge is situated in the heart of Breckenridge, giving you easy access to both the mountain and downtown Breck. It’s just across the street from the Four O’clock ski run and mere steps from historic Main Street. On your crew’s first powder day avoid long lines thanks to a convenient onsite rental shop. Once your crew has all their gear make sure everyone’s got sunblock on their noses and hand-warmers in their pockets, and head out. No need to fight for parking or hike across icy lots. You can walk to the Snowflake lift a couple blocks away, but why bother when there’s a complimentary ski shuttle that will take you right to the gondolas? Your crew will be stoked you’re staying so close to the mountain - Breckenridge is the kind of ski resort that measures its snowfall in feet instead of inches (over 25 feet yearly!). With 34 lifts, 187 trails and almost 3,000 acres of terrain it’s no wonder Breck is one of the most-visited ski spots in the Western Hemisphere. A bit rusty? A top notch ski & snowboard school has lessons for all ages and levels, first-timer programs to advanced clinics - including classes for tots as young as three. At the end of a day well-skied, just ride down Peak 8 along the 4 O’clock run and you’ll coast right up to River Mountain Lodge. Leave your gear with the onsite ski valet and see how fast everyone can swap snow jackets for swimsuits. There’s both indoor and outdoor hot tubs ready to soothe your tired limbs as your crew swaps stories from the slopes. Individually-decorated studios and one- and two-bedroom condos vary in style, but are consistently clean and homey with alpine accents. Fully equipped kitchens lets you enjoy home cooked meals – away from home. Spacious living areas feature a cozy fireplace and cable TV, prime for downtime with the crew. In-unit washer/dryer makes sure everyone always has fresh base layers. Meanwhile private balconies with mountain views are perfect for scoping out the snow over your morning coffee. You won’t have go far to find a great après hangout, just swing by the Fireside Lounge in the lobby to enjoy creative drink specials and socialize with fellow travelers. 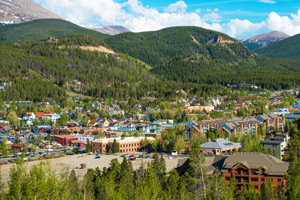 Plus, there’s more to Breckenridge than totally rad skiing/riding. Take a stroll down Main Street and browse the quaint Victorian storefronts until you get hungry – then pick from an array of tasty eateries, ranging from casual comfort food to upscale steakhouse. Not to mention all the winter fun to be had off the slopes, like a snowmobile tour or a horse-drawn sleigh ride.